Reishi mushroom (Ling Zhi in Chinese, Ganoderma lucidum and other related species) has been revered since the dawn of Asian culture as a tonic herb that protects us physically and psychologically. In ancient times Reishi was referred to as the ‘divine fungus’ and it has been used throughout Asian history as the symbol of enlightenment and mastery. It is China’s ultimate Shen tonic. It has been used by millions of spiritual adepts over their full lifetimes. Reishi has long been recognized as a “supreme protector,” and is now acknowledged as a profound immune tonic, supporting the many functions of the amazingly intricate human immune system. 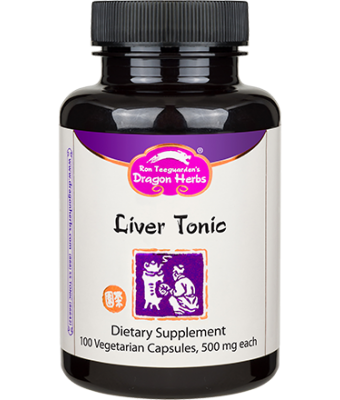 Reishi supports the normal detoxification functions of the liver. Red Reishi, the variety most commonly studied, contains over 900 bioactive constituents. Reishi supports healthy aging. 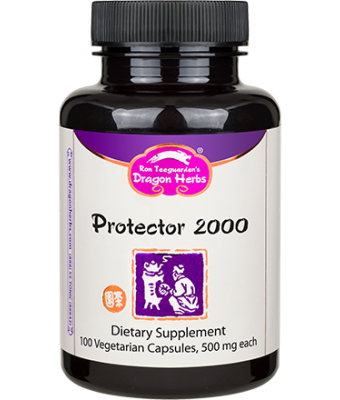 Dragon Herbs is the number one purveyor of Asian Reishi products in America. 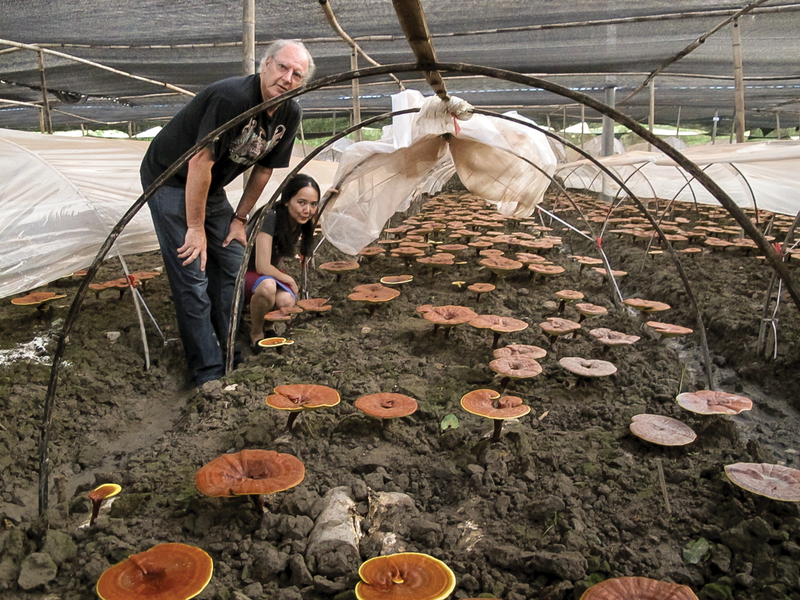 Ron Teeguarden has been a purveyor of Reishi mushroom products since the 1970s. 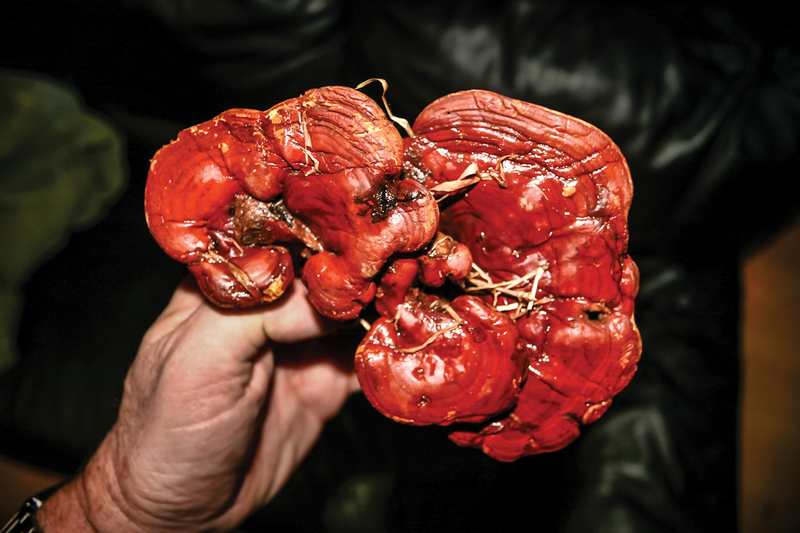 Over the last twenty five years he has spent hundreds of hours with Reishi collectors and growers in Asia. 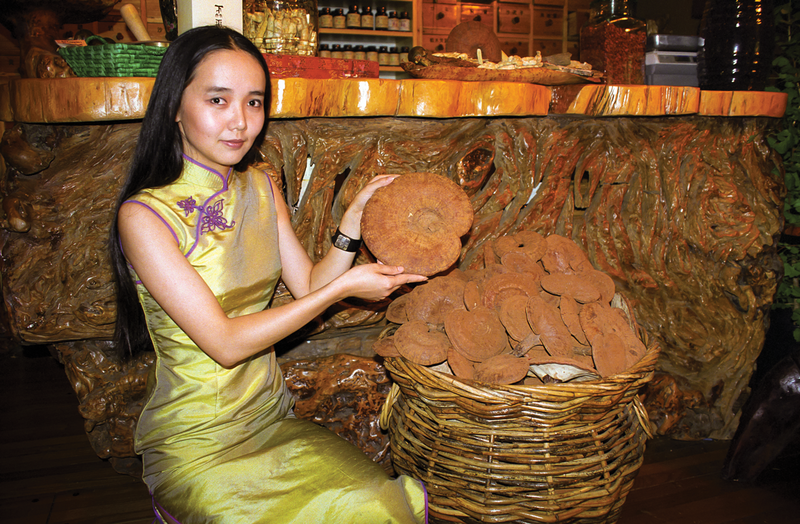 Ron and his Dragon Herbs team have identified the best-of-the-best Reishi from places like Changbai Mountain in Manchuria and Wuyi Mountain in South China. There are several ways that Reishi is offered. We offer it in both capsule and tincture forms. 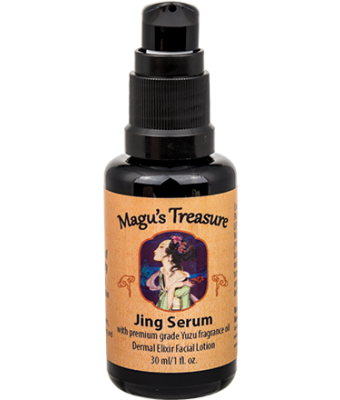 We offer it in powder form, combined with a few other tonic herbs, for use in teas and elixirs. 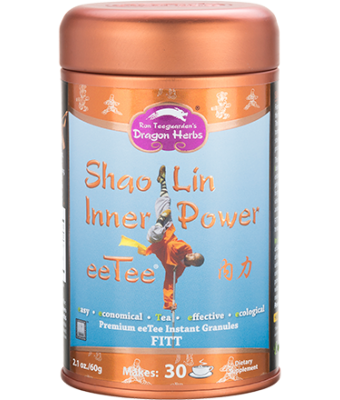 Dragon Herbs does not ever sell raw ground-up powdered Reishi. Numerous studies have shown that humans cannot digest or assimilate ground Reishi powder. Reishi is known as a “woody mushroom” that cannot be digested by humans in its raw form. Reishi must be extracted. All Dragon Herbs Reishi products are concentrated extracts, whether they are liquid, powder, oil or FITT powder (Fingerprint Identical Transfer TechnologyTM). Ganoderma (“Reishi”) mushroom has over 100 different varieties, of which some are considered to be the true “mushroom of good fortune,” while others are not. Most brands of Reishi on the American market use inexpensive hothouse-grown mushrooms, grown on sawdust. 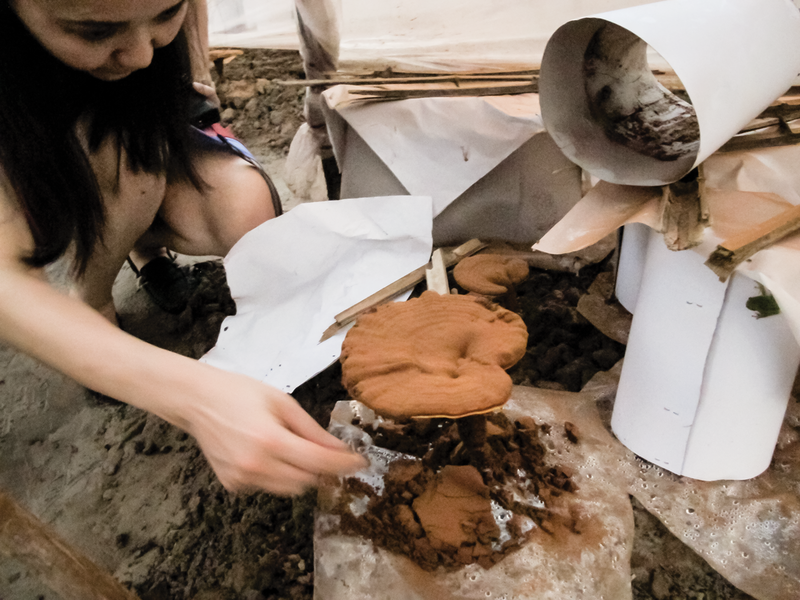 In fact, most Reishi for sale is not even the mushroom — it is the mycelium, the fungal mass that can be mass-grown before the mushroom sprouts. This mycelium is not as good as the true fruiting body (mushroom cap). To make matters worse, most often, this mycelium has not even been extracted at all but is simply ground into powder. Non-extracted Reishi mushroom is of little biological value to a human, since it cannot be assimilated in raw form, and is a waste of money. 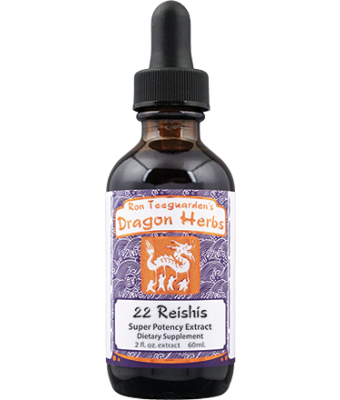 Dragon Herbs only uses true Reishi mushroom caps. In making our cultivated Reishi products, we select only superb, naturally grown DuanwoodTM Reishi as the starting point of the production process. Duanwood ReishiTM is grown in mountain plantations away from pollution, fed by mountain springs and streams. We painstakingly extract all of our herbs using ultra-modern extraction technology in order to protect them and concentrate their phytochemicals. It takes about 10 pounds of Reishi mushrooms to make just 1 pound of powdered Reishi extract. All the extraneous woody material is removed, and what you get is the biologically, nutraceutically active essence of the Reishi that contains all the active constituents that make Reishi a great tonic herb. Thus, when you take a concentrated form of Reishi (a natural 10:1 extract), you are taking the equivalent of 10 times the weight of non-concentrated raw material. Also, Reishi must be extracted slowly and properly in water and alcohol in order to make the active substances bio-available. The non-extracted product is not at all bio-available — you cannot absorb non-extracted Reishi into your bloodstream. Though extracted Reishi appears to be somewhat more expensive than non-extracted products, it is in fact a much better value for your money — and for your health. It could take up to 50 capsules of non-concentrated Reishi, if you can digest it at all, to match just 1 capsule of DuanwoodTM Reishi powdered extract. There are a number of varieties of Reishi. Wild Red Reishi is the most commonly used wild form, collected in high mountains throughout northern Asia. 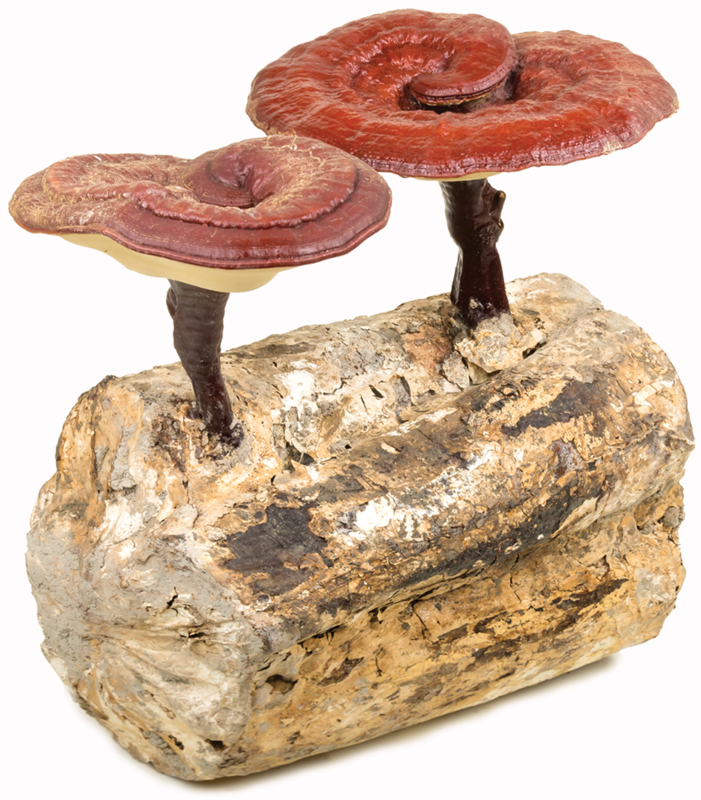 Reishi can be cultivated very naturally by growing it on logs cut from high mountain forests. 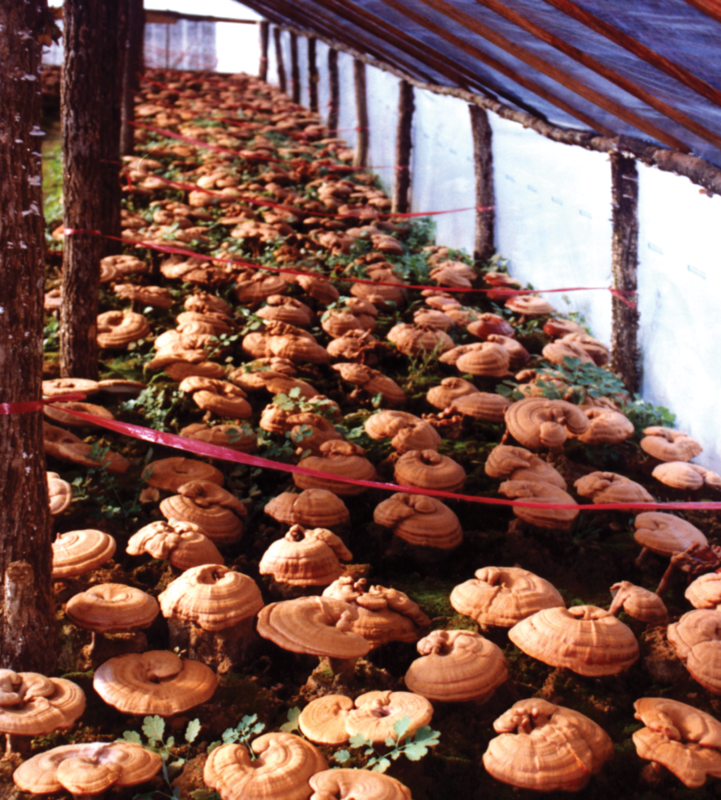 This type of cultivation is very natural and produces very powerful, standardized Reishi. The original wood logs are known as “duan mu.” Dragon Herbs Reishi is organically grown and we call it “duan wood” Reishi. DuanwoodTM is a trademark of Dragon Herbs. The Reishi comes in several colors from different mountains. Red Reishi is most common. Purple Reishi is very rare, but is considered very desirable by connoisseurs because it has a gentle flavor with potent benefits. Reishi reproduces by producing “spores.” The spores are completely non-digestible by humans in the raw form, but if they are “cracked” or “broken” the nutrients inside the microscopic spores become assimilable. Dragon Herbs only sells this “cracked” spore in the products with Reishi spores. Also, a very valuable oil can be extracted from the cracked spores. 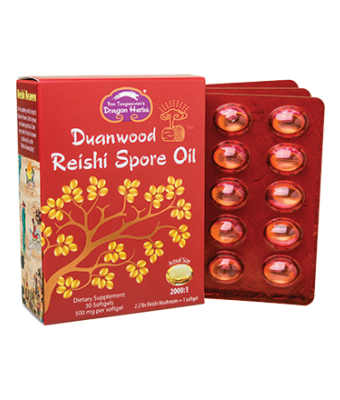 This Reishi Spore Oil is one of the healthiest natural materials on earth. 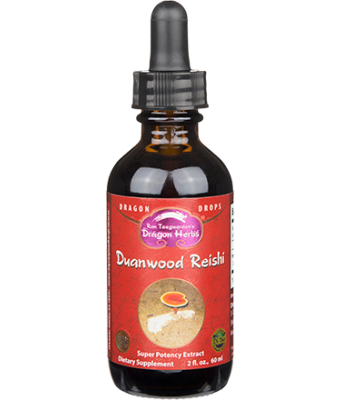 Dragon Herbs Reishi Spore Oil is unadulterated (not combined with other oils to cut price). Left: "Reishi Heaven." 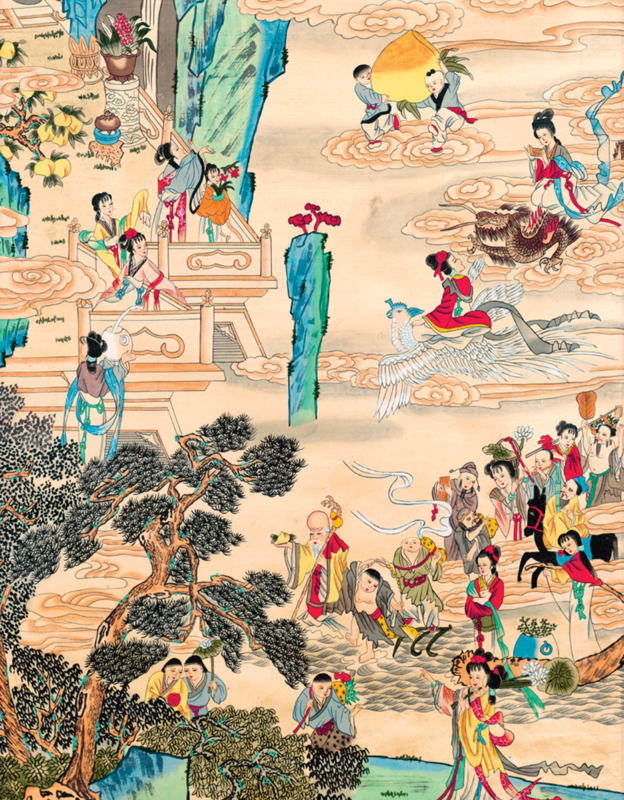 This is a painting of Chinese paradise, where a stone pedestal at its center bears a pair of divine Reishi mushrooms. 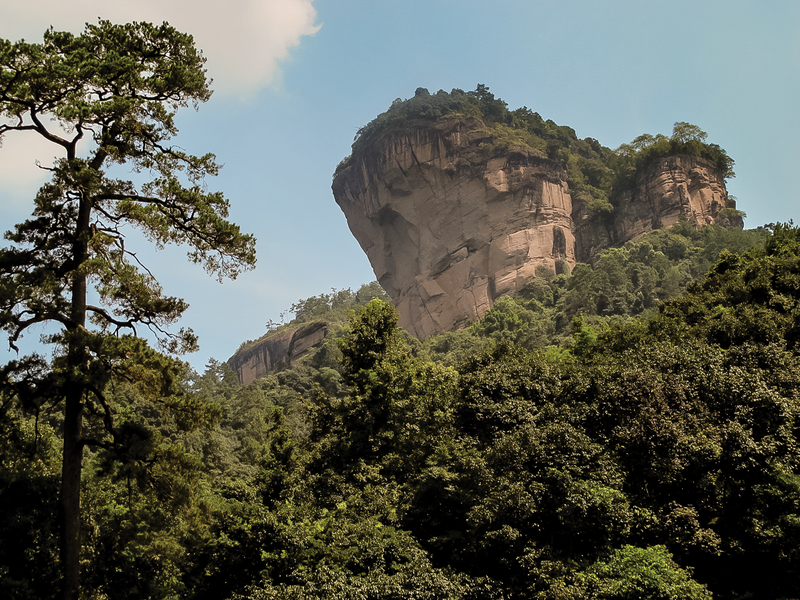 Right: The exquisite Wuyi Mountains in Southern China are a major source of tonic herbs. 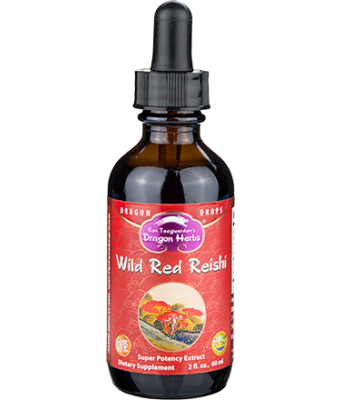 Dragon Herbs offers an unmatched variety of Reishi products. 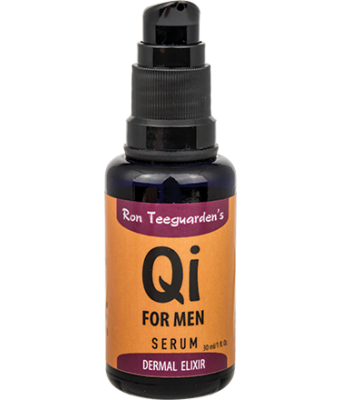 Qi Serum Dermal Elixir 1 fl. oz. 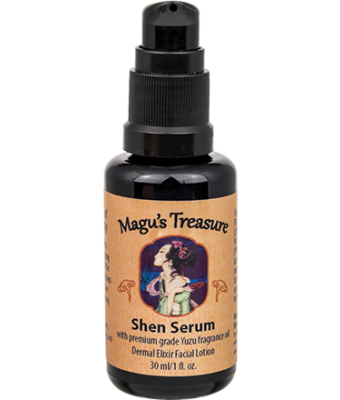 Shen Serum Dermal Elixir 1 fl. oz. Find more products that contain Reishi mushroom as its main ingredient.